Old houses have what most people refer to as charm or character: uneven and crooked floors, walls, doors and windows. Wood, the prime building material in old houses, is a living being, it reacts and adapts to external forces, creating the charm and character. Gunk Haus is not different. This charm can sometimes be a hindrance, for instance when installing drywall. 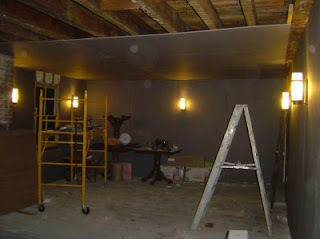 We managed to install only five sheets of drywall today (all wall, no ceiling), because we hit so many odd spots, where we either had to shim the studs or trim off excess wood, which would have required us to bend the drywall to the point of failure. But it is starting to look like a room.